A low valuation combined with aggressive buybacks combine to make Goldman Sachs a compelling investment. Goldman Sachs' headquarters in Jersey City, NJ. Image credit: iStock/Thinkstock. As shares of Goldman Sachs (NYSE:GS) have gotten hammered during the past three months, losing nearly 25% of their value since the middle of November, it's finally gotten to the point where I think they're too cheap to ignore. It's this reason, backed by Goldman's aggressive track record of buying back stock, that convinced me to pull the trigger on the investment bank's stock. 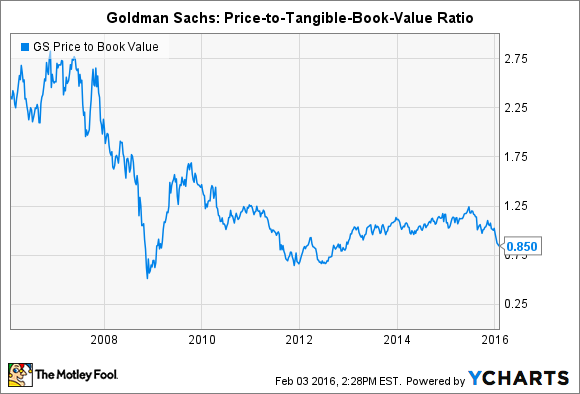 It's impossible to ignore that Goldman Sachs' shares trade for a roughly 15% discount to its tangible book value. This typically happens when a bank doesn't return 10% or more on its common equity -- meaning that its annualized net income divided by its common shareholders equity is less than 10%. GS Price to Book Value data by YCharts. This is true in Goldman Sachs' case. In 2015, it returned only 7.4% on its average common shareholders' equity. What's important to realize, however, is that Goldman's earnings took a $2.99 billion after-tax hit last year due to a settlement with the federal government over conduct stemming back to the financial crisis. There's no doubt that that translates into an actual loss. But there's also little doubt that it's outside of Goldman's standard operating procedures. If you back this out, in turn, Goldman's return on average common shareholders' equity comes out to 11%. That's a much more respectable return, and it's one that would ordinarily translate into a price-to-tangible-book value ratio above 1.0. Based on valuation alone, then, it seems to me that Goldman's shares are selling for a discount. Even more promising from a long-term prospective, however, is Goldman's tendency to buy back large amounts of its common stock. Over the past four years, it's repurchased an average of $1.3 billion worth of stock each quarter. This added up to a total of $4.2 billion in 2015, $5.5 billion in 2014, $6.2 billion in 2013, and $4.6 billion in 2012. The impact of this on shareholders is twofold. First, it reduces Goldman's outstanding share count. As the shares are purchased, they're effectively retired. This consolidates ownership around remaining shareholders. 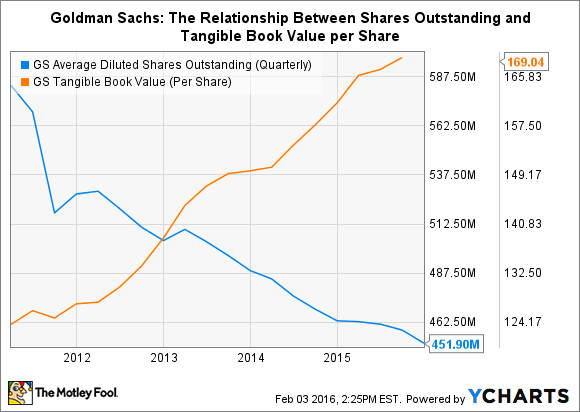 And second, though it's a corollary of the first, it boosts the tangible book value of each remaining share. This is because the company's tangible shareholders' equity is now dispersed over fewer shares. GS Average Diluted Shares Outstanding (Quarterly) data by YCharts. To be clear, share buybacks aren't universally good. In the lead-up to the financial crisis, Bank of America and Citigroup spent roughly $40 billion each on buybacks that could have otherwise been used to absorb losses from the subprime mortgage market. This caused the banks to later raise capital by issuing new stock at much-lower valuations then they had bought it back. This translated into the massive dilution that, even today, means that their shares are worth 75% and 90% less, respectively, than they were before the crisis. I think it's reasonable to assume in Goldman's case, however, that its executives will be shrewder about capital allocation. Not only did the investment bank prove its metal in the financial crisis, so to speak, but it's also run by some of the savviest operators on Wall Street. They understand how to create value. And given that many of them own large numbers of Goldman's shares themselves, they have a direct incentive to make sure they do so when investing billions in buybacks. In short, when you combine the fact that Goldman's shares are currently trading for a meaningful discount to tangible book value with the investment bank's historically aggressive approach to share buybacks, it seems to present a compelling opportunity for investors.